It might have taken 14 hours to crown the latest EPT champion but when the betting had finished it was Julian Track who'd stood drenched in confetti in Prague. At the start of the session the huge average stack size had many players and spectators wondering if the finale would be stretched over two days; however, as the pros began to fall it became clear that those in attendance would stay the course until the deed was done. Falling at the first hurdle and short of a six-figure payday was Finland's Jorma Nuutinen after an all-in with A-K fell short against Julian Track's pocket tens. With the elimination floodgates slowly creaking open, Zdravko Duvnjak, Max Silver and Ole Schemion were the next to fall as the field dropped to four. With the trophy now beginning to glint on the horizon the surviving quartet took a few moments away from the table before composing themselves back at the felt. At this point Ke Kwan Lau found himself in the firing line when his top pair was caught out by Georgios Sotiropoulos's two pair. Now that the Spanish rail wasn't able to congratulate the country's first winner, it looked as though Stephen Chidwick was going to make a strong bid for the title. Being the most experienced player left at the final table, the eyes of the media quickly darted in Chidwick's direction but as the weight of expectation grew so did the pressure. Eventually the young Brit made a move with A-T but couldn't find his way past the K-Q of Sotiropoulos who managed to catch a pair on the flop which turned into trips by the river to scoop the decisive pot. With Chidwick now counting his €378,000 consolation prize on the rail, the final two players decided to cut a deal. With Track suffering from a bout of flu the negotiations didn't take long as he wanted to end things as quickly as possible. 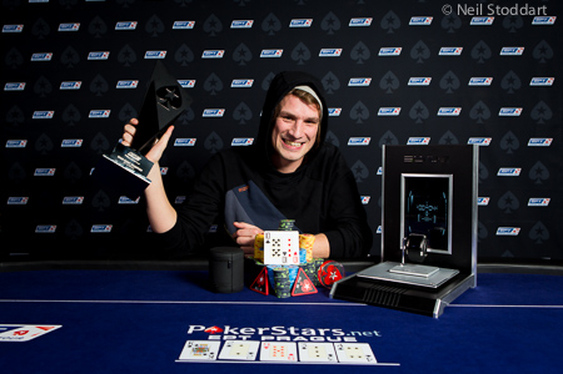 With the money split 50/50 and a few thousand left to play for the final throes of the match flew by until Track's pair of tens helped him clinch the final pot, his first EPT title and the €725,700 top prize. The next stop on the European Poker Tour is the PokerStars Caribbean Adventure which runs from 5-13 January. Qualify online at PokerStars.